The Sony PlayStation 4 Pro is an enhanced version of the PlayStation 4 console. It supports the entire library of PS4 games, and it delivers superior image quality. The PlayStation 4 Pro supports 4K-resolution content, HDR technology, and the PlayStation virtual reality headset. Special PS4 Pro Enhanced games are designed to take advantage of the unique features of the Pro system. This version of the PlayStation 4 console comes with a 1TB hard drive and a wireless DualShock 4 controller. Has performed exceptional and the picture quality is unmatched. 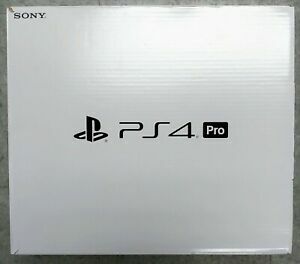 I love everything about the ps4 pro and will be putting it through tremendous use. I have played destiny on ps4 and now playing destiny 2 on this ps4 pro and it is absolutely amazing. Sometimes I just stop playing for a second because I’m literally in awe of the picture quality. I am playing on a Vizio 4k tv so I now have a very capable 4k system on a 4k tv and couldn’t be happier. It arrived very quickly and was packaged with great amount of protection and care. Greatest experience I’ve ever had on eBay. This is genuinely a great product that is worth every penny! Good selection of games to choose from, and the UI/interface of this console is very well-designed. Also the fact you can listen to Spotify while playing is just one example of the many great features this console offers. It has been a great supplement to my PC gaming desktop. The graphics are so real that they are Unreal I'm still getting to learn my new PS4 pro so far so really good I would suggest you Ask for one for Christmas or get one for your self. You won't be dissapointed: make sure you have a 4k TV. Can’t go wrong with a Sony product. Upgraded from the Slim and the extra power and memory are worth the extra price. I got it for my older son and he really loves it. Now he can play games he couldn't play before and it is so much better. It changes everything to make you feel like you are right there and he has wanted it for awhile and he is happy.